This article is about the chess move 'en passant'. For other uses, see En passant (disambiguation). En passant (French: [ɑ̃ paˈsɑ̃], lit. in passing) is a move in chess. 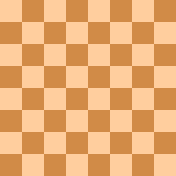 It is a special pawn capture that can only occur immediately after a pawn makes a move of two squares from its starting square, and when it could have been captured by an enemy pawn had it advanced only one square. The opponent captures the just-moved pawn "as it passes" through the first square. The result is the same as if the pawn had advanced only one square and the enemy pawn had captured it normally. The en passant capture must be made on the very next turn or the right to do so is lost. Like any other move, if an en passant capture is the only legal move available, it must be played. En passant capture is a common theme in chess compositions. 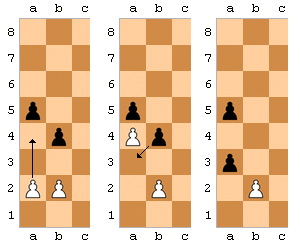 The en passant capture rule was added in the 15th century when the rule that gave pawns an initial double-step move was introduced. It prevents a pawn from using the two-square advance to pass an adjacent enemy pawn without the risk of being captured. Animation of 1...d5 and 2.exd6e.p. the capture can only be made on the move immediately after the opposing pawn makes the double-step move; otherwise, the right to capture it en passant is lost. The black pawn is on its initial square. If it moves to f6 (marked by ×), the white pawn can capture it. Black moved his pawn forward two squares in a single move from f7 to f5, "passing" f6. White captures the pawn en passant, as if it had moved only one square to f6. There are some examples of en passant in chess openings. In this line from Petrov's Defence, White can capture the pawn on d5 en passant on his sixth move. Black just played 5...d7–d5. White's e5-pawn may capture en passant. Another example occurs in the French Defence after 1.e4 e6 2.e5, a move once advocated by Wilhelm Steinitz. :2 If Black responds with 2...d5, White can capture the pawn en passant with 3.exd6. Likewise, White can answer 2...f5 with 3.exf6e.p. An example is from this game by Steinitz and Bernhard Fleissig. Black to move. Should he play ...g5+? In the diagram, if Black plays ...g5+, it seems to checkmate White, but it is in fact a blunder. Black overlooks that White can counter this check with the en passant capture fxg6, which cross-checks and checkmates Black. This game is a draw if neither side errs. After 14...g7–g5. White mates by taking the pawn en passant. Note that the bishop on c1 effects the check, via a discovered check. 14...Kh7 results in 15.Qxg7#. The en passant capture and discovered checks place Black in checkmate (from White's rook on h1, even without help from White's bishop; an en passant capture is the only way a double check can be delivered without one of the checking pieces moving, as in this position). The capture 1... exd3e.p. shifts the e4-pawn from the e- to the d-file, preventing an en passant capture after White plays 2. f4. To stop the threatened mate (3.f5#), Black may advance 2... f5, but this allows White to play 3. exf6e.p.# with checkmate due to the decisive opening of the e-file. The motivation for en passant was to prevent the newly added two-square first move for pawns from allowing a pawn to evade capture by an enemy pawn. :16 Asian chess variants, because of their separation from European chess prior to that period, do not feature any of these moves. ^ "Steinitz vs. Fleissig, 1882". Chessgames.com. ^ "Gundersen vs. Faul". Chessgames.com. Retrieved 2009-06-12. ^ A. Segal vs. K. Podzielny, Dortmund 1980. Published by 365Chess.com. Retrieved on 2009-12-05. Look up en passant in Wiktionary, the free dictionary.